When we talk about rest as a fundamental element of our training, we do not only refer to the breaks we have to make between sets or exercises. We must also take into account the rest between workouts, since this is where our body will recharge its energies to be able to train again. But, why is this break so important? Although we feel rested, the body has periods of recovery, and shortening them can mean submitting to too intense effort and suffer unpleasant consequences known as the SSE: Overtraining Syndrome. This was the case of Alberto Salazar, Geoff Roes, Mike Wolfe and, recently, Bobby Clay (a young athlete of only 20 years). Alberto Salazar is currently coach of the ” Nike Oregon Project “, but between the years 1980 and 1984 at the height of his professional career as an athlete, Salazar broke three American track records and won three consecutive years of the New York marathon . However, in 1984 his career would begin a downhill without brake until his retirement in 1998. That same year, in 1984, Salazar finished fifteenth in the Olympic marathon in Los Angeles . After the 1984 Olympic Games, Salazar would suffer continuous respiratory infections for ten years , in addition to falling into depression. During this time, he tried unsuccessfully to find out what was happening to him, without arriving at a definitive diagnosis. The year of his retirement, in 1998, he was barely able to complete races that exceeded 30 minutes . Tim Noakes, a professor at the University of Cape Town in South Africa, would later classify the sudden and chronic loss of performance of Alberto Salazar with the term Myopathic Syndrome of the Fatigued Athlete . Speaking of Geoff Roes is talking about one of the eminences in terms of ultratrails is concerned, because it has a really enviable track record: in 2006 won his first ultratrail race in the Little Susitna (50 kilometers), in 2009 set a record in the Wasatch 100 with a time of 18:30:55, in 2010 he won the American River 50 Mile Endurance and the Western States Endurance Run with a time of 15:07:04, among other data. However, in 2011, Roes began to notice that something was not going well: if he ran short distances or periods of time less than five hours, he felt “good”, but when the distance or that time increased, the results plummeted and its performance plummeted . He tried to reverse this situation by increasing his breaks, but the results hardly improved. 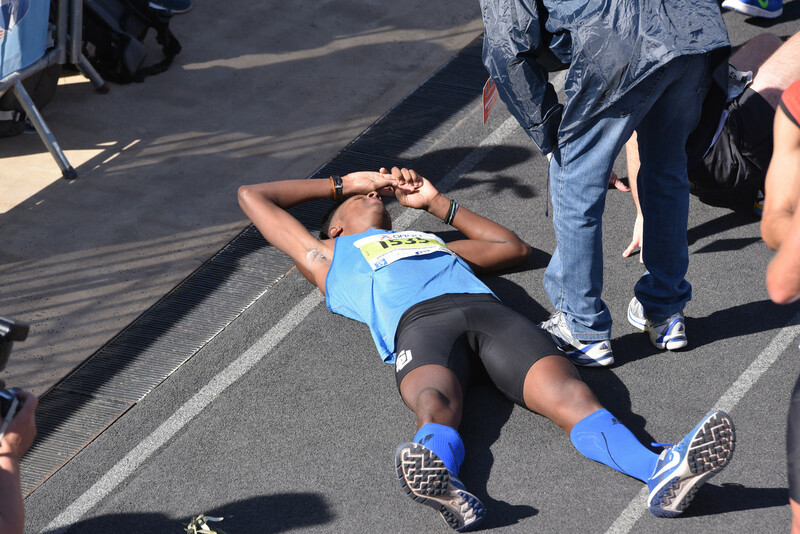 And it was in the summer of 2012 when the most serious problems began : intense muscle weakness, fatigue, numbness, tingling, anxiety … And even the need to urinate every 10-15 minutes in some races. Definitely his body had exceeded its limits . Roes himself confesses to having felt “really terrified of these symptoms”, and between the months of August and September of that same year, he needed to go to the emergency room at least half a dozen times . When for the first time someone suggested the possibility of overtraining syndrome (SSE) , Roes thought that it was impossible for the syndrome to present such a severe clinical picture, but as the months passed and his physical condition improved very slowly, he was unable to find another explanation for what had happened to him that was not the SSE . The Transvulcania is an ultramarathon that since 2012 is part of the Skyrunner World Series calls , being the test that opens the circuit. The case of Mike Wolfe is that of a lawyer who left his job to run on the North Face athletic team . Prior to his debut at the Transvulcania, Wolfe had already won victories at the North Face Endurance Challenge Champioship in 2010 and at the Bighorn 100 in Wyoming . However, in pre-race training, Wolfe had repeatedly noted in his training diary that he felt tired, that he was not sleeping well, and that the feeling of hunger was continuous . It was the prelude to the disaster that was to come . The day of the test, Wolfe came out and did everything possible to stay in the leading group, reaching the first climb of six thousand feet with Dakota Jones and the Spanish Kilian Jornet. However, halfway through Wolfe began to slow down and finish the race in thirteenth place. A hard psychological blow for him, whose causes he would not be able to explain until one year later. He had suffered SSE: Over Training Syndrome . Bobby Clay is a young British athlete of only 20 years who has recently been news in many sports media for the consequences that overtraining has had on his bodyat such a young age. At age 15, Bobby Clay was one of the great promises of British athletics , especially in cross-country events. Among his achievements at such an early age was being a member of the Sub20 team despite having only 15 years. His coaches predicted a great future and, at the same time, they tried to keep his feet on the ground. However, when he went from cross to track athletics it was when the problems began to be detected . Although she recognizes herself, trained and competed like everyone else, she always wanted more and more , but she began to feel that she lacked strength despite continuing with her day to day life. Although she was subjected to medical examinations, and that at 16 years had not yet had her first period, the medical diagnosis was “late development”, and Clay herself saw as an advantage over her rivals not having the period. But it would be the year that came of age when everything would change and Clay would be aware of the extreme that had led to his body: swimming, in a gesture as simple as a flip, Bobby fractured one of his feet . Before this injury was subjected to various tests, and could check the physical state in which his body was : with just 18 years, Bobby suffered from osteoporosis and, now, should stop training. “In sport there have always been cases that we have cataloged as ‘pseudoanorexies’, because when an athlete is in an extreme situation instead of increasing his performance, it is easier to make him see where the problem is. Underlying a basic psychological problem, unleashed by sport, which is more complicated to deal with “. To recover from the consequences that overtraining left in his body and his body , Clay has been undergoing a ” hormone replacement treatment ” for several months in order to increase the bone density of his bones (besides having also received psychological treatment, since it is very difficult for an athlete to recognize that he suffers overtraining). The RED-S syndrome ( Relative energy deficiency in sports ) refers to a deterioration of physiological function including, among other factors, the metabolic rate, menstrual function, bone health, immune system , protein synthesis or cardiovascular health , and is caused by energy deficiency between intake and energy expenditure required for health and activities of daily living and sports activities. To this affectation of the energetic, menstrual and bone health functions , it is commonly known by the nickname of ” triad of the female athlete”. As we can see the RED-S affects many aspects of the health of the athletes and, although there are factors such as the alteration of menstrual function that are specific to female athletes, this syndrome can also be suffered by men , since the contribution energy can be reduced and be insufficient both if you are a woman or if you are a man. In addition, we must point out that in the early stages, this syndrome is still reversible, but in the most severe cases there can beirreversible hormonal alterations and bone density, with all that this means for the health of the person.